Partner Pickin' ! | Primary Planet! This is one of those, "Duh, why didn't I think of that moments!" Thank goodness I work with brilliant people! I have my kiddos work with "Thinking Partners" in class. A LOT! and they have to cross the whole room to talk to each other! So, my wonderful colleague and friend Kelley came up with a simple yet amazing idea! Every morning as part of our "Morning Business" the kiddos choose a partner for the day. They put their colored chip next to their partners. They know that they have to speak with that person, and each person has to move their own colored chip. That way if someone is absent, they won't have a partner. Then, they keep that partner for the entire day! For reading, writing, math, everything! She and I do it a bit differently. 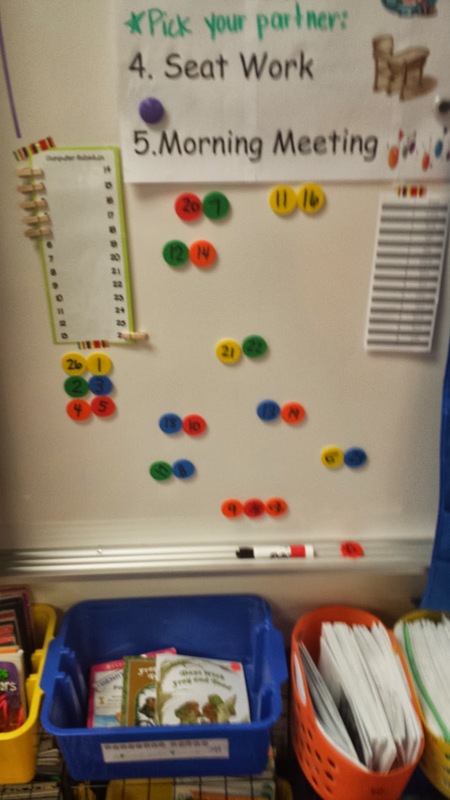 In Kelley's room, she calls one table at a time based on who is working quietly! It is an incentive to work quietly so you can be the first to choose your partner! In my room during our Reading Workshop I have some kiddos on the computers (that is the clip chart in the picture. 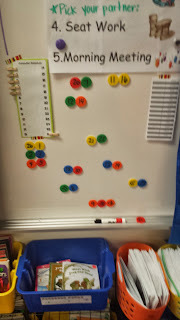 I move the clips to indicate who is on the computer for Reading Workshop that day). If they go on the computers, they cannot choose read with a partner for the next round, so I choose their partners for them from the other kiddos on the computers for the day. Then they still have a partner for everything else during the day. The kiddos know that if we are sitting together on the magic carpet, that they need to sit with their "Thinking Partner" for the day. They also know that choosing their own partners is a privilege, and if they don't make the best choices, then I get to make it for them next time! I had some extra colored circle counters, so I used those to make my chips. Kelley just used laminated paper circles. Then you need a little magnetic tape on the back! Voila! This little gem of an idea has saved me so much grief and time this year I had to share it with the world! This sounds like a great idea, but what do you do if they pick the same partner every day? Do you have any additional guidelines? Wow! Hi Laura! That's a great question. It depends on the day. Sometimes I choose partners using the chips, sometimes the boys have to choose girls, sometimes I choose some partners for the kiddos who will be going on the computer for the day. Sometimes we do evens/odds, sometimes same color or not same color. It is a very versatile way for us to choose partners. Thanks so much for stopping by! I think another great way to encourage choosing different partners daily is to teach them about getting to know different people in the class and how important it is to learn from others that we normally wouldn't. Everyone has something special to offer the class and this is a great idea, I love it!!! Thanks Luann! I do encourage that as well, but you know Second Graders! A few are open to that approach. Sometimes they learn to enjoy new partners when I choose them as well. Thanks so much for stopping by and commenting! My students love The Hat random partner picker. There are 3 themes and music as well. If there is an odd number of students, the last student chooses the pair they want to work with. That sounds like fun Sheri! I will have to look into it! Thanks so much for stopping by!